All our personalised dog treat jars are handmade to order for us here in England. We have a range of patterns and colours for you to choose from and you can also buy a matching dog bowl. Our personalised ceramic dog treat jars can also be put in the dishwasher. These treat jars for dogs are the perfect place to store your dogs favourite biscuits. Handmade in the UK exclusively for Chelsea Dogs comes our lovely range of treat jars for dogs. Choose from a gorgeous range of patterns and colours including paw prints, stripes and spots. 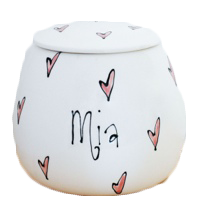 For an additional cost and by special request only, we can personalise your treat jar with your dog’s name around the terracotta base. Our ceramic dog treat jars are a perfect way of keeping your dog’s treats nice and fresh whilst also looking stylish on your kitchen counter or in the cupboard. The benefits of having a biscuit jar for your dog is that you can open a variety of different flavoured dog biscuits and mix them up in the jar so your dog will have a surprise treat every time and not get board of one flavour treat.